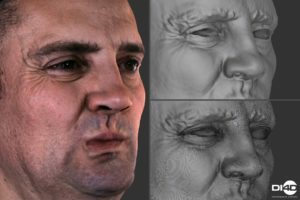 Facial performance capture company DI4D has announced they will unveil their highest fidelity facial performance capture so far at SIGGRAPH, which takes place at the Los Angeles Convention Center, 01 to 03 August 2017. DI4D’s proprietary “motion scanning” technology reportedly captures 4D data comprising video rate 3D surface scans tracked with a dense fixed topology mesh. The DI4D solution, which does not require any markers, make-up or structured light, aims to provide much higher fidelity facial motion capture data than alternative solutions and ensure that every nuance of an actor’s facial performance is recorded. Using a DI4D PRO system upgrading with nine 12 mega-pixel synchronised video cameras, the company has been able to capture higher fidelity 4D data than ever before.